With newly-acquired Jakob Silfverberg, Kyle Palmieri, Nick Bonino, Emerson Etem, Cam Fowler, Luca Sbisa and Sami Vatanen, the Ducks have a lot of good, young players in their system. These kids will be good, but the Ducks may be expecting them to take on a lot more and much too soon. After a strong start to the 2012/2013 season, the Ducks faded down the stretch and lost to the no. 7 seed, the Detroit Red Wings in the first round of the playoffs. If the kids can perform over an 82-game season like they did in the first 30 games of the shortened season, they’ll make the playoffs. But that’s a big if. After years of confusion – should they go for it or should they go on a rebuild – Brian Burke, the Flames’ new President of Hockey Operations, should now give the organization some sense of direction. And that direction is a rebuild. It’ll be a long year in Calgary. Sven Baertschi, Mikael Backlund, Max Reinhart and Sean Monahan provide some hope up front, but the cupboard is otherwise barren. It’s the same in the back end where they have Mark Giordano and T.J. Brodie, but not much else. By the time this season is all over and done with, the Flames may well be in a position to draft Max’s brother, Sam, who currently sits no. 1 in the 2014 NHL Draft rankings. Aside from the injuries to Ryan Nugent-Hopkins and Sam Gagner, there’s a lot to like in Edmonton these days. Taylor Hall should make Team Canada in Sochi. Jordan Eberle should return to 30-goal form. Nail Yakupov is, quite simply, a helluva player. Meanwhile, David Perron and Boyd Gordon give the Oil some veteran help up front, and newly-minted captain, Andrew Ference, provides some much needed leadership and grit from the back end. Adding Ference and drafting Darnell Nurse was a start, but overall, the Oilers are still a small bunch. Incredibly skilled and talented, but small. The Oilers’ speed and skill rank up there with the best in the league. A bit more tinkering and it’s not inconceivable that they make the post-season for the first time in 8 years. They’re that close. Like the Blackhawks, the Kings have enjoyed much post-season success recently and have managed to retain their core. With Dustin Brown, Anze Kopitar, Mike Richards, Jeff Carter, Justin Williams, Drew Doughty and Jonathan Quick all at their prime years and signed for a few more seasons, life should be good in La-la-land. Sadly for Canucks fans, I can’t think of any. 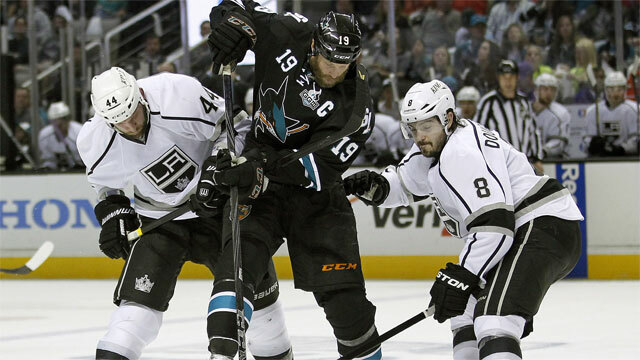 Sadly for Canucks fans, the Kings are positioned to remain one of the best in the West. There’s finally some stability in the Coyotes’ ownership situation – or at least there is until they lose their first $50 million. Goaltender Mike Smith re-upped long-term, and so did defenseman Oliver Ekman-Larsson. Signing Mike Ribeiro will help the league’s 25th-ranked PP. Besides Ribeiro, and perhaps an improved Mikkel Boedker, the ‘Yotes don’t have a lot of offensive pop up front. Smith will keep the Coyotes in most games, but unless they can improve on the NHL’s 21st-ranked offense, they’ll miss the postseason for the second consecutive season. Logan Couture may have slowly surpassed Joe Thornton as the Sharks’ no. 1 center. And it’s saying something when Joe Thornton is your no. 2 center. Add Patrick Marleau, Joe Pavelski, and promising rookie, Tomas Hertl, and the Sharks have some enviable depth up front. The defense isn’t as deep, and neither is their goaltending. In fact, it’s scary to think what would happen if goaltender Antti Niemi ever suffered an injury. This could very well be the last kick at the can for Thornton, Marleau and Dan Boyle – long-serving Sharks who are all unrestricted free agents at season’s end. After 7 years of hearing the same message from head coach, Alain Vigneault, the Canucks fired AV and replaced him with the much more abrasive, John Tortorella. Torts vowed to play a more aggressive system and to make the Canucks a harder team to play against, which would be a welcome change to those of us who witnessed the passive and predictable system from the last couple of seasons. Besides the coach, the biggest change was in goal, where Roberto Luongo is, by virtue of Cory Schneider being traded to the New Jersey Devils, once again the Canucks’ no. 1 goaltender. Elsewhere, the Canucks simply tinkered and Torts will have to make lemonade from pretty much the same group of lemons AV had. Despite the resounding pessimism present in Canucks Nation, the Canucks should be able to compete for one of the final playoff spots in the Western Conference. Next story So You Want to be a CHBer?